*the dress pattern also comes with one for leggings which i haven't had a chance to make yet but definitely will be soon. leslie, it looks amazing! the composition of the fabrics is just perfection. i'll have to check out these patterns too. oh my lord, that is so cute!! LOVE your fabric and this pattern! Love it! And it's great with your fabric. 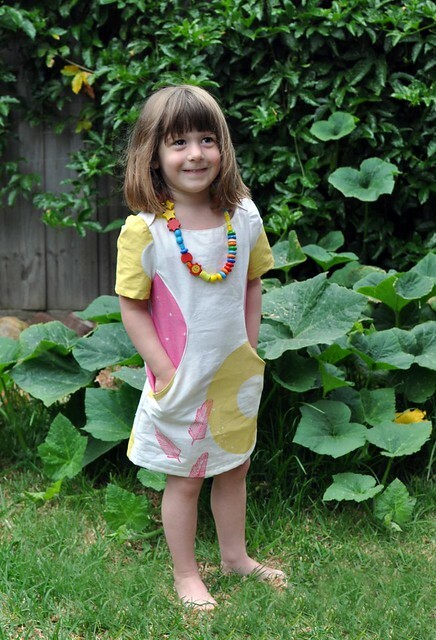 Such a beautiful dress using your fabric! Thank you so much and I am so glad to hear you like the pattern!! YAY! I've totally been eyeing off that pattern! Why can't I be a tester!?! 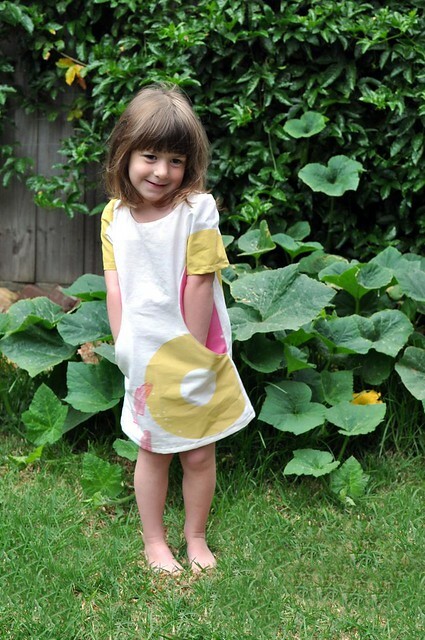 I LOVE it made with your hand printed fabric - it is incredibly cute on Mae! I've been eyeing this pattern off, the interior pockets would be a big hit with my girls. I love your version, your fabric is fabulous, clever you. How beautiful. It's a shame my daughter is now 15 and not 5. I would love this dress for myself - do they make adult sizes? i wish they did, lisa - i wouldn't mind one for myself, either! You are on crafting fire! Love the fabric and love the dress!! so, so beautiful, and the fabric that you printed the fabric yourself makes it even more so. great job! Gorgeous! So annoyed my kid is too big for it! The fabrics are beautiful, Mae looks so happy in it! Gorgeous fabric, it works beautifully with the Sunki pattern. it's super cute Leslie and I can tell Mae loves it too! Beautiful fabric; love the pattern. I'm also having thrifting envy. There is rarely anything good in my neck of the woods. Great finds! I am in love with this dress in your fabric. Yours came out beautifully. I also enjoyed sewing it. I made it in Liberty corduroy and Ms. S loves wearing it. Mae looks so happy in it. 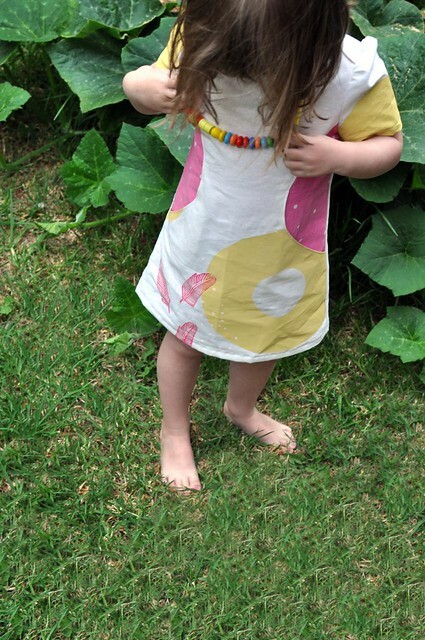 I would love to get some of your prints in yardage for a dress for her soon. Ooh, looks fantastic. I had just pinned this pattern too! Such a lovely pattern and fabric! I would not mind doing this for myself. I do hope I can find something similar in an online boutique. 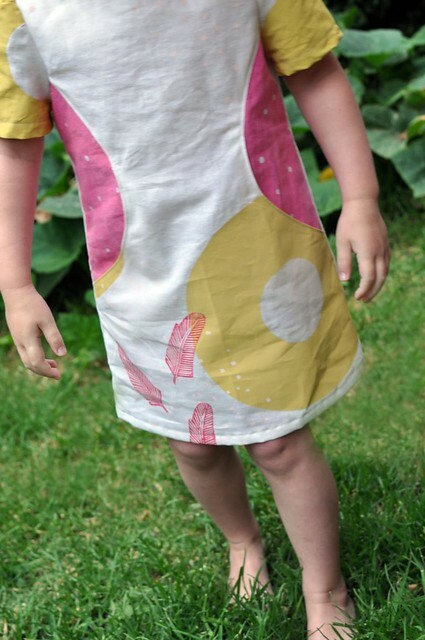 Love the fabric you used and I loved your pattern review. Just what I needed to get this dress finished! Thanks!